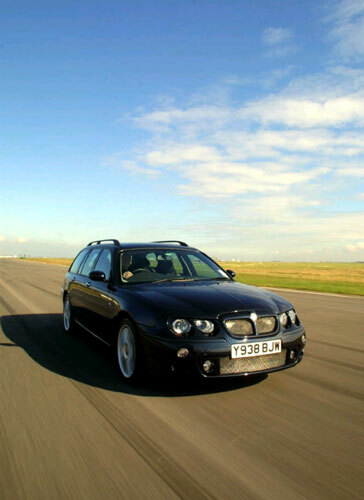 The MG ZT saloon and ZTT tourer ranges were announced in 2001 and were significant developments from the award winning and only then two year old Rover 75 ranges. The MG versions featured very sporting suspension, uprated brakes, individual engine specs, sporting gearing together with bespoke exterior and interior treatments to generate a true MG and individual character. This very comprehensively separated them from the Rover 75 range. Initially available only with the KV6 2.5 litre engine in two forms, 190Ps and 245Nm of torque driving through a 5 speed manual gearbox with a lowered final drive to aid acceleration and response, or with 160Ps and 230Nm driving through the same gearbox but with longer ratios. From mid 2002 the model variations and options have increased dramatically. His has seen the range gain 1800cc 4 cylinder K series engined versions with 120Ps and 160Ps, diesel and auto models. The 160Ps specifically has been very successful using a turbo version of the 1800cc K series engine that provides only slightly less performance than the ZT190 but with quantifiable advantages in fuel consumption and tax efficiency. It can’t compete with the KV6 engine smoothness though. The 4 cylinder versions were clearly aimed at the business and cost conscious market. In recent years the dramatic rise in diesel popularity has been mirrored by a major raft of developments with the design and efficiency of these engines. No saloon model range will do well without a modern diesel engined version. For diesel engined ZT it was initially available using the same engine and gearbox as seen in the Rover 75 diesels. This engine is a modern 2 litre twin cam 16 valve turbocharged engine using modern common rail injection and made by BMW, with versions of this engine used in BMW 3 series models, and the Land Rover Freelander TD4. When introduced the engine delivered an adequate 116ps and 260Nm of torque, the latter providing perfectly adequate performance. As time passed and competitors raised the power stakes an XPower conversion (a software upgrade to the engine management) raised the power to 131ps together with 300Nm of torque. This soon became a production option and provided two diesel models the base CDTi and the CDTi 135, later still the 116ps version was dropped from the MG range. Rationalisation was also seen elsewhere in the range with the apparent conflict of having two 160 models, the 1800cc 4 cyl turbo and the 2500cc KV6, solved by dropping the KV6 160 model. The KV6 190 model continued and prior to this there was the introduction of the ZT 180 auto using a 177ps version of the KV6 mated to a 5 speed Jatco auto gearbox. Trim levels varied with base and ‘+’ (plus) models initially that then saw an additional top range ‘SE’ spec introduced which eventually replaced the ‘+’ spec. The ZT is a modern car and carries a wide range of electronic options, buried within a complex electronic backbone within the car. The range of variable settings that can be configured is surprising to most owners who are not aware of the range of these options that can be configured by a dealer or specialist with the dealer diagnostic equipment and software. For example how many wiper sweeps to accompany the washer, headlamp on delay after switching off to illuminate your walk to your front door, speed locking, where the central locking locks the car at around 5mph, single door or multiple door unlocking, etc. The reputation of the Rover 75 and MG ZT is justifiably strong and it has to be remembered that it was designed and brought to production during the BMW period. It is a car designed to BMW standards using many BMW parts and this solid core design and engineering was not diluted with the development to the MG ZT, and indeed it was actually enhanced with the development of the MG ZT 260, all of which were pure in house MG Rover developments. The MG ZT 260 is covered separately. 1997cc 4 cyl twin cam, 4 valves per cylinder diesel with 116 in the CDTi models, and 131ps in the CDTI 135 models. Manual 5 speed Getrag gearbox with sporting lower ratios for the 190, or 5 speed Jatco automatic transmission.